The Fellowship was fortunate enough to obtain a copy of CLASSIC POPEYE #3 from IDW Comics. The stories and art is by Bud Sagendorf. 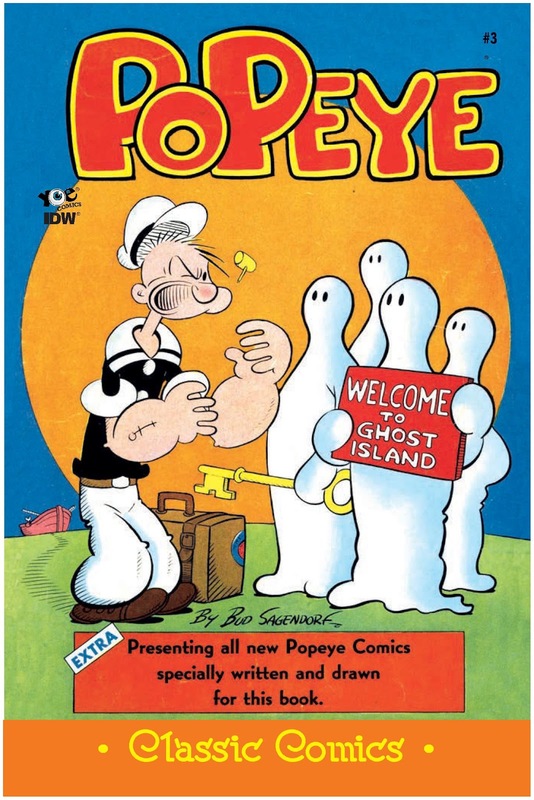 In the main story, Popeye is asked to help deliver five hundred ghost traps to Ghost Island. He’s not interested until the ghosts kidnap Sweet Pea. In the second story Wimpy, Olive Oyl, and the others are trying to figure out why Popeye is walking around punching his friends. In addition, there are two one page comic strips featuring Sweet Pea: one involving an ice cream cone, the other a doll. Also included is a neat map chronicling Popeye’s voyage in the first story. Reading these stories is such a nice change of pace. While other books feature multi-issue story arcs with complex characterizations, here is a comic that feature multiple stories that are simple, straight forward and fun to read. For those who don’t know, Bud Sagendorf was the assistant to the creator of Popeye E. C. Segar. He knew the characters well, and it shows in this series. Definitely worth picking up if you are a fan of the character or want something fun to read. CLASSIC POPEYE #3 is in stores now and available at www.idwpublishing.com.